Turkey's President Recep Tayyip Erdogan on Saturday said solution to the Nagorno-Karabakh issue is "sine qua non" for mending relations with Armenia. Speaking at an event to mark the 100th anniversary of the liberation of Baku by the Caucasian Islamic Army, Erdogan recalled the 1992 Khojaly massacre that killed hundreds of Azerbaijani citizens. "Those who cannot explain what happened in Khojaly 26 years ago, the massacre in the Nagorno-Karabakh, and declare the killers heroes, should not give Turkey any kind of history lesson," Erdogan said, referring to Armenia. Erdogan also added that "those who occupy 20 percent of Azerbaijani lands and prevent over 1 million Azerbaijanis to return to their land should not expect Turkey to open its borders". 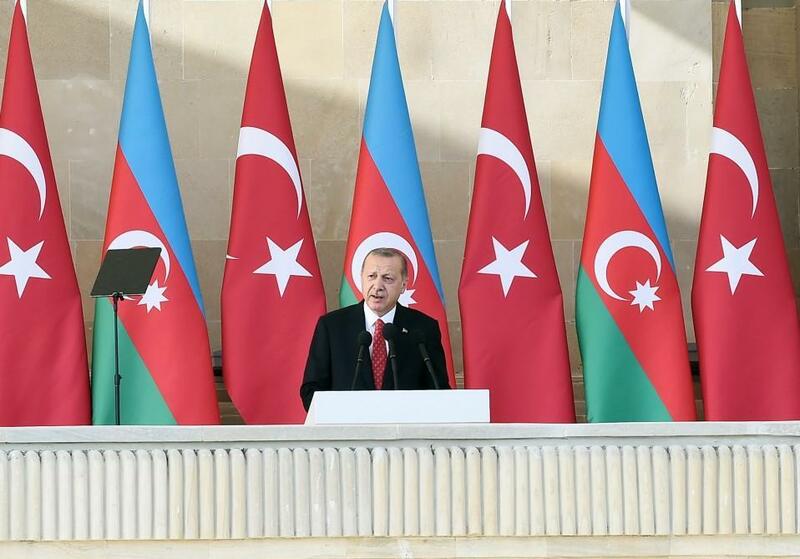 Erdogan said Caucasian Islamic Army protected the territorial integrity of Azerbaijan in 1918 and laid the foundation to Azerbaijan's independence in 1991. "Since the early periods of Azerbaijan's independence, Turkey supported the brother country in every way and we will continue to do so," he said. The Turkish president also highlighted that there are lots of projects to be realized in near future, including Baku-Ceyhan-Tbilisi Oil Pipeline, Baku-Tbilisi-Erzurum Natural Gas Pipeline and Trans Anatolian Natural Gas Pipeline (TANAP) projects. "Turkey is one of the biggest investor countries in Azerbaijan, hopefully Azerbaijan will become too in Turkey soon," Erdogan said.